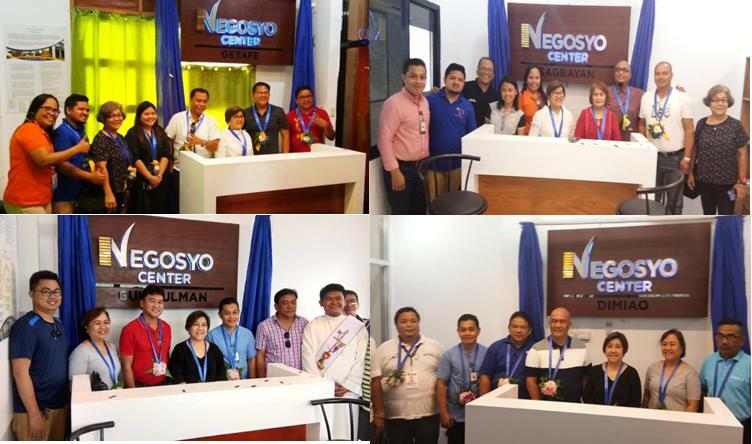 The Department of Trade and Industry-Bohol recently launched four new Negosyo Centers in the province. Negosyo Centers of Getafe and Sagbayan as well as Guindulman and Dimiao were inaugurated last December 21 and 27, 2018 respectively. Present during the launching were Mayor Casey Shaun M. Camacho of Getafe, Vice Mayor Charito Lao of Sagbayan, Mayor Albino Balo of Guindulman and Mayor Danilo Guivencan of Dimiao, DTI Regional Director Asteria C. Caberte, DTI Bohol Provincial Director Maria Soledad L. Balistoy, and representatives from the Bohol SMED Council and the respective Local Government Units. A major highlight of the events was the signing of the memorandum of agreement between DTI and the respective Local Government Units. In her message, PD Balistoy said that strategic location and huge growth potentials of the municipalities were the top considerations in the identification and establishment of these centers. “A seed has been planted and we, in DTI, would be glad to see this seed grow in order to foster business growth and development as we open these Negosyo Centers in your towns”, she added. Furthermore, DTI Regional Director Aster Caberte expressed congratulations to the said LGUs, highlighting her appreciation on the strong commitment of local officials, which is a key factor in the successful establishment of the centers. Aside from improving ease in doing business, the centers aim to assist entrepreneurs in improving their capabilities by providing them with customized assistance package suitable for their respective businesses. The establishment of Negosyo Centers is in line with the enactment of Republic Act No. 10644, also known as the Go Negosyo Act, a policy to foster national development, promote inclusive growth and reduce poverty in the countryside. “We already have a total of 16 Negosyo Centers in Bohol, and we are proud to say that in choosing these locations, we considered the economic dynamism of the LGUs, and again the support and commitment of local officials. We are now asking your cooperation in disseminating information about these centers as we implement our programs thru the Negosyo Serbisyo sa Barangay,” Caberte added. 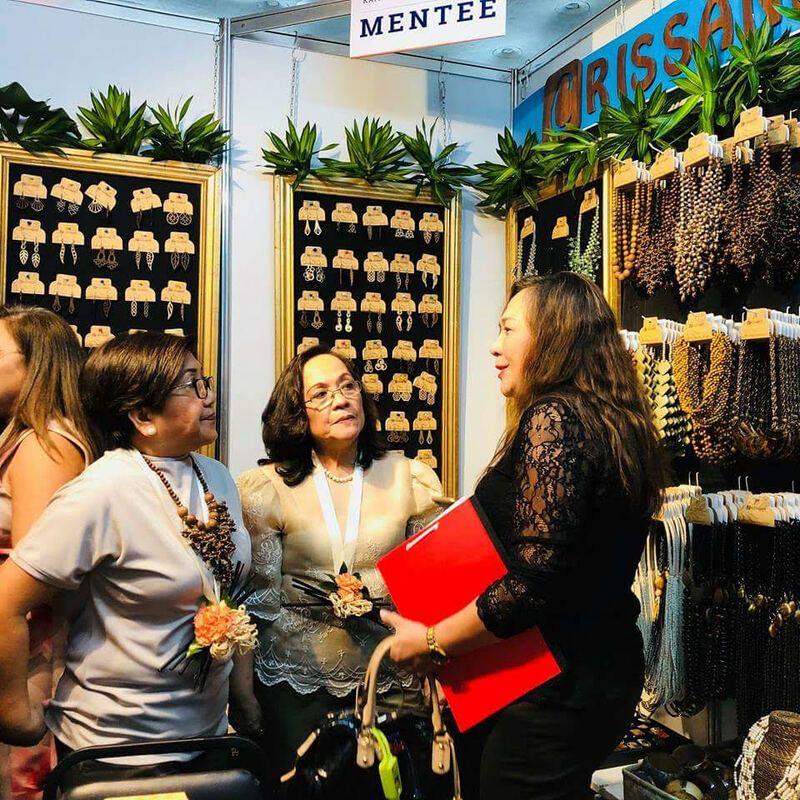 Last 20 November, the Department of Trade and Industry (DTI) in partnership with the Philippine Center for Entrepreneurship – Go Negosyo gathered the mentee graduates, certified mentors and enablers in the 2018 Kapatid Mentor ME Summit held at the Waterfront Cebu City Hotel. KMME Summit was launched with the aim to delve into the inspiring entrepreneurial journey of top business experts, build network and strengthen the relationship amongst the mentees, mentors, and enablers, provide a B2B avenue to the participants through showcasing the products of mentee-graduates and to continue capacitate development opportunities for both the mentors and mentees. Usec. Zenaida C. Maglaya was present during the summit and shared the KMME accomplishments from the past two years and how it greatly helped the mentee-graduates. KMME Summit provided two sessions focusing gender sensitivity and building MSME resilience to disasters which were facilitated by Carmen Lopez, Supervising Project Officer of Great Women Project 2 and Rene S. Meily, President of Philippine Disaster Resilience Foundation (PDRF). One of the highlights of the summit was the Pitch to Reach: The KMME Challenge, an activity that was crafted to be a platform for KMME mentee-graduates to learn and understand how to pitch and see this as a practice session. Eight mentees presented their respective business plans to a panel for pitching. Accordingly, the top eight finalists were lucky to be coached by Carlo Calimon, the Director of StartUp Village. On the list of the panelists for the Pitching Activity were Steve Benitez of Bo’s Coffee, Dr. Cecilio Pedro of Lamoiyan Corporation, Josephine Romero of Magpie, Prof. Willy Arcilla of Arcilla Marketing and Leadership Consultancy and Clarke Nebrao of Terravida Natural Ventures. Highlighting the importance of integrity on being a successful entrepreneur, forum one entitled Business Leaders: The Untold Stories of Success was presented during the summit. The panelists were Justin Uy, Profood International Corporation; Dr. Cecilio Pedro, Lamoiyan Corporation; Jay Aldeguer, The Island Group; Steve Benitez, Bo’s Coffee and Bunny Pages, Pages Holding Inc. The forum was moderated by Virgilio “Nonoy” Espeleta, PCE Visayas Coordinator. 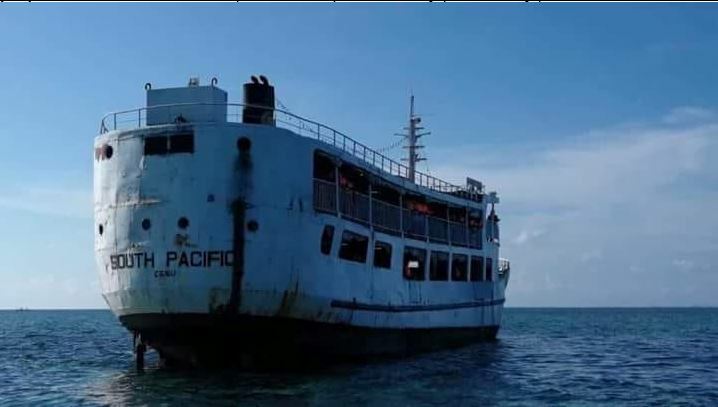 The Philippine Coast Guard (PCG) in Bohol scored plus points when all they rescued 64 passengers and 19 crew from a boat that ran aground early morning of October 9, 2019, in the vicinity seawaters off Danajon Bank. PCG search and rescue team dispatched to the site also assured that aside from the slight dents in the boat’s hull, the grounding boat did not damage the area, had no damaged propellers and noted no oil spills. The boat: MV South Pacific operated by Southern Pacific Transport Corporation is a 230.99 gross ton passenger ship and cargo vessel with a capacity of 204 passengers and has Cebu as home port. MV South Pacific accordingly left Bato, Leyte at 9:00 PM October 8 with 59 passengers and 19 crew members, according to the captain of the ill-fated ship, Arturo Sullano. While cruising off to Cebu, the boat strayed into the shallow waters and accidentally ran aground at about 1:00 AM, the skipper said in his report. Good the incident happened in calm seas, otherwise it could be a major problem, observers who learned of the incident commented. It was about 3:55 AM on October 9 that PCG PO1 Uy relayed to Coast Guard Tagbilaran the information and the exact coordinates of the grounding incident, for proper action. Coast Guard Station (CGS) Tagbilaran then immediately called CGS Talibon to verify and report. By about 4:15 of October 9, CGS Talibon established contact with the ill-fated boat captain, who confirmed the incident. CGS Talibon then dispatched a search and rescue (SAR) team to do visual and surface inspection. By early morning, the PCG SAR team boarded the boat and conducted an inspection in the engine room and steering room, accompanied by the ship’s crew. The team also found no water seepage or spillage and noted that the passengers were all in good physical condition and no one was injured during the incident. To facilitate the extraction of the stuck boat, the PCG them proceeded to transfer the passengers to PCG’s Multi Role Response Vessel (MRRV) and used a rubber boat to ferry the passengers to the PCG boat. From L to R: DTI Undersecretary Zenaida C. Maglaya, DTI Secretary Ramon M. Lopez, IPOPHIL Deputy Director General Teodoro C. Pascua, and Bureau of Trademarks Director Leny B. Raz during the signing of the extension of the Juana Make a Mark program. Pampanga – The Department of Trade and Industry (DTI) and the Intellectual Property of the Philippines (IPOPHL) is extending its Juana Make a Mark program that waives trademark application fees to 1,000 Micro, Small, and Medium Enterprises (MSMEs). Through the program, MSMEs can save up to Php 3,000 from waived basic filing, color claims, and first publication fees. “Juana Make a Mark is part of our strategy to help the MSMEs be part of the local supply chain and eventually venture out to the global market,” said Trade Secretary Ramon Lopez. During the MSME Summit last July 10 in Clark, Pampanga, DTI and IPOPHL signed an extension to their original Memorandum of Agreement (MOA) that expired last February 14. The program’s effectivity is extended to February 14, 2019, or until all applications have been availed. SOUTH KOREA—The Philippine (PH) business delegation and South Korean counterparts signed a total of USD 4.8B-worth of investment pledges and business expansion intentions during the PH-Republic of Korea (ROK) Luncheon and Business Forum on 5 June 2018. These agreements are estimated to generate 50,800 employment opportunities in the country. The Department of Trade and Industry (DTI) led the event signing, which gathered over 400 business delegates from both countries and comprising of new operators as well as subsidiaries of conglomerates operating in the country. DTI reported that the 22 signed business agreements– six Memoranda of Understanding (MOUs) and 16 Letters of Intent (LOIs) — were presented to President Rodrigo Duterte during his visit in South Korea. These are in addition to the five MOUs signed between the governments of the Philippines and South Korea. The business agreements cover expansion intentions for operations on power infrastructure development (offering 2,200 jobs), engineering and construction (2,000 jobs), solar power (1,000 jobs), electric automobile business operations (10,000 jobs), wind power plant (10,000 jobs), dredging and port rehabilitation (100 jobs), freshwater eel production (50 jobs), and real estate development (1,500 jobs). Hyundai Motor Co. (HMC) expressed its intention to participate in the PUJ modernization program by providing environmental-friendly automobile technologies. HMC proposed a mid-term and long-term investment plan to construct an assembly plant in the country for passenger vehicles. Meanwhile, SK Energy and Services is keen on investing in LNG and power infrastructure development and operation, as well as LNG trading. The company is also looking expanding its business activity on city-gas distribution in the country. POSCO Engineering & Construction Co. Ltd. intends to expand its operations in PH valued at USD 200 million and expected to generate over 2,000 jobs. According to Sec. Lopez, the wide-range of business agreements also reflect small and medium enterprise (SME) assistance from South Korea. Taeseong Kimchi Company expressed their plans to expand its kimchi food production in the country, which would open 20,000 employment opportunities. Further, the company will apply an inclusive business model that seeks to engage with local farmers from Benguet for its operations. Other expansion intentions came from various South Korean companies, including BKS Energy Industry Ltd., Phillips Holdings Co. Ltd., SY ENC Co. Ltd., Jungheung Construction Co., Ltd., JS Development Co. Ltd., PNK Aquaculture and Trading, and Andamiro Corporation. During the bilateral meeting between the two governments, discussions on the establishment of the Joint Commission for Trade and Economic Cooperation (JCTEC) were opened as well as the possibility of a Preferential Trade Agreement for the lowering of South Korean tariffs on PH agricultural products. Both governments also agreed on furthering agricultural, science and technology, as well as security cooperation. Sec. Lopez, Department of Finance (DOF) Secretary Carlos Dominguez III, and Department of Agriculture (DA) Secretary Emmanuel Piñol gave the business delegation a comprehensive economic and investment briefing. The Cabinet Secretaries provided actual figures and situationers of the country’s business environment. “The Philippine government is committed in widening its trade engagements with other nations under President Rodrigo Duterte’s independent foreign policy. With the South Korean business community as our partner, we are confident of making progress with government initiatives like the “Build, Build, Build” infrastructure program, and the thrust towards developing Micro, Small, and Medium Enterprises (MSMEs),” said Trade and Industry Secretary Ramon Lopez. Four LOIs between South Korean companies and the Cagayan Economic Zone Authority (CEZA) were signed, indicating collaborative efforts in rehabilitating and modernizing the economic zone through reclamation and initiatives related to fintech, blockchain technology education, tourism, gaming, and other related business activities. “Our next goal now is to ensure that these investment pledges and job opportunities will materialize, and allow us share the economic gains of the country, especially to those at the bottom of the pyramid,” Sec. Lopez added. On the MOUs signed, the Philippine Chamber of Commerce and Industry (PCCI) and Philippines-Korea Economic Council (PHILKOREC) came up with an agreement with KBIZ for an exchange of information on commerce, industry, and trade opportunities focusing on small, medium enterprises. Likewise, PCCI inked an agreement with Korea Importers Association (KOIMA) for the promotion of trade, economic, scientific, technological cooperation, and other business relations. In the field of die and mold industry, Philippine Die and Mold Association (PDMA) signed an MOU with Korea Association of Machinery Industry (KOAMI) to create a pool of manpower trained in die and mold designing, making, processing, assembly, and other related courses. Meanwhile, South Korean’s DaeKyung Engineering Co., Ltd. sealed an MOU with Philippine Utility Vehicle Inc. (PhUV) for a joint development and promotion of green business in the country, as well as smart grid and electric vehicles. DaeKyung will also explore the co-development and co-assembly of the modern electric vehicle prototype by providing the powertrain and other parts.